I have never been happy with the way that the Sharlin performed in the game compared to the show. I couldn't quite put my finger on it until the Brakiri Kaliva Lance Cruiser and its Gravitic Lances were introduced. When we see the Minbari fire their forward neutron lasers we always seem them fire a single sustained blast. This got me to thinking that the perfect representation of this would be a single neutron lance, firing an auto-sustaining shot. The neutron lance is scaled up from the neutron laser the same as the gravitic lance is scaled up from the graviton beam. 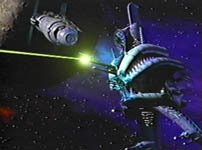 It provides the Minbari with a truly devastating weapon system and better represents much of the screen evidence.